A novel pneumatically-driven balloon-based tactile feedback system is currently under development for lower-limb amputees and for patients with lower-limb sensory neuropathy. The system will translate the pressure distribution on the feet into tactile information which can in turn be relayed to the body through a series of balloon actuators. For persons with lower-limb amputation, peripheral sensations are severely attenuated through an artificial prosthetic limb during gait. While crude pressure sensations can be detected between the residual limb and socket interface, this feedback is imprecise compared to a healthy limb. A sensory feedback system has been developed to provide a form of auxiliary lower limb sensory feedback. It is believed that this technology can impact gait by providing feedback regarding changing prosthetic plantar pressures during each step.Patients with lower-limb sensory neuropathy may also benefit from this technology by receiving supportive auxiliary feedback regarding the state of lower-limb extremities, potentially impacting walking and balance performance. A prototype haptic feedback system has already been developed, and preliminary perceptual tests have demonstrated that healthy subjects can distinguish the location and magnitude of stimuli on the upper leg with accuracy greater than 90%. Development and clinical testing of the device is in progress at CASIT in collaboration with Rehabilitation Medicine Department and Gonda Vascular Center at UCLA, with the Naval Medical Center San Diego, and the San Diego Naval Health Research Center (NHRC). 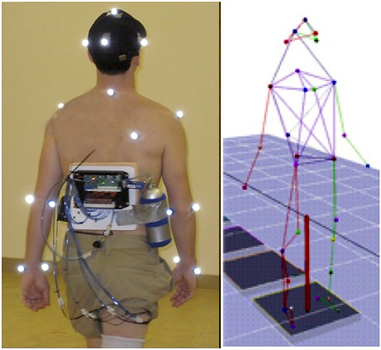 Biomechanical gait analysis using infrared markers and cameras to quantify characteristics of walking performance including velocity, cadence, step width, step length, limb support timing, ground reaction forces, and joint (hip, knee, ankle) moments and angles. Funding for the project was provided Telemedicine and Advanced Technology Research Center (TATRC) / Department of Defense under award #W81XWH- 09-2-0023 and #MIPR9BDATM9044, and the National Science Foundation under award #CBET-0730213. Fan R, Culjat M, King CH, Franco M, Boryk R, Dutson E, Grundfest WS, "Haptic feedback system for lower-limb prostheses," IEEE Transactions on Neural Systems and Rehabilitation Engineering, 16(3), 270-277, 2008. Fan RE, Culjat MO, King CH, Franco ML, Sedrak M, Bisley JW, Dutson EP, Grundfest WS, "A prototype haptic feedback system for lower-limb prostheses and sensory neuropathy," Proceedings of Medicine Meets Virtual Reality 16: parallel, combinatorial, convergent: NextMed by design, 31 January - 1 February 2008, Long Beach, CA, Studies in Health Technology and Informatics, 132, 115-119, 2008. Fan RE, Culjat M, King CH, Franco M, Dutson E, Grundfest WS, "A haptic feedback system for lower limb prostheses," BMES 2007 Annual Fall Meeting, Los Angeles, CA, 26-29 September 2007, Abstract # 182368. Fan RE, Culjat MO, King CH, Franco ML, Boryk R, Bisley JW, Dutson EP, Grundfest WS, "A Prototype haptic feedback for lower-limb prostheses and sensory neuropathy," Medicine Meets Virtual Reality 16: parallel, combinatorial, convergent: NextMed by design, 31 January - 1 February 2008, Long Beach, CA, 2008. Culjat MO, Fan RE, Grundfest WS, "Optimization of a tactile feedback system to aid the rehabilitation of lower-limb amputees," Virtual Rehabilitation 2008, 25-27 August 2008, Vancouver, Canada.